Making College Accessible By All Readers. Welcome to the CampusReader home page, an NSF-funded five-year project dedicated to designing and evaluating electronically delivered reading strategies for post-secondary students with cognitive and learning challenges. Our target students have high level reading impairments that affect reading comprehension and retention and hinder the pursuit of college or trade programs. The project proposes to leverage the growing popularity of the iPad and other emerging computer-based reading platforms to deliver quality supports to improve students’ abilities to understand and retain what they read. 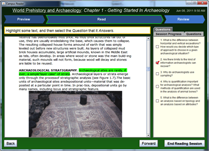 The focus is on integrating reading strategies with online textbooks. 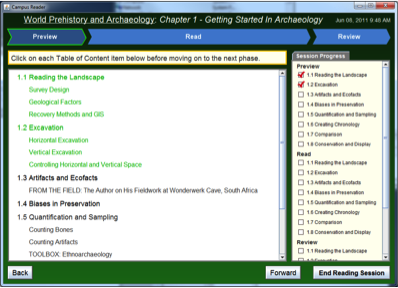 Ideally, as a student sits down with their computer to begin their online reading assignment, the CampusReader software will work in the background to extend the textbook content with strategies that fit with the student's reading profile. Our goal is to give each student a personalized reader to fit their needs. To develop the necessary strategies, we will conduct pilot studies, laboratory experiments and long-term evaluations. The CampusReader project will attempt to provide the science that is missing from the literature that links reading impairments with reading strategies, and develop a demonstration tool that supports an assessment process and a delivery mechanism. For the first 4 years of the project, we will be working closely with active duty service members and veterans who have cognitive challenges resulting from brain injury and/or PTSD, and now are attempting to enroll in specialized training programs or to return to university or community campuses to resume their education. Our partners will be the Portland VA Research Foundation and the Tripler Army Medical Center in Honolulu (TAMC). The CampusReader project will also consult with Pearson and other major textbook publishers that work to develop and distribute online textbooks. During the latter portion of the project, we will work with both an urban university and a community college to (a) integrate the CampusReader in a more traditional classroom setting, and (b) work with a wider range of students with reading-comprehension issues. We have an email sign-up to get announcements of project milestones, events and available technology. Thanks for visiting. (Full Professor, Computer Science) does research in the area of software engineering, and in particular, requirements engineering; he has chaired the flagship conferences in both areas [RE93, ICSE09]. He also is co-founder and the first chair of the IFIP 2.9 Working Group on Requirements Engineering. He has headed the Wearables Computing Lab at the University of Oregon since 1995. Professor Fickas headed the NSF Software Engineering Research Center (SERC) for five years, where he worked closely with partner companies attempting to do uptake of university research. Over the past nine years, he has participated in numerous lab and field studies centered on successes and failures of assistive technology for those with a cognitive impairment. From this experience, he co-developed the PC-RE model as well as the Software Pharmacy framework, both at the center of this project. (Full Professor, Communication Disorders & Sciences, University of Oregon) is a full Professor in Special Education and Clinical Sciences within the College of Education (COE) at the University of Oregon. According to U.S. News and World Report (2009) the UO COE faculty leads the nation?s education researchers in productivity as measured by research award expenditures per tenured faculty member demonstrating high level of institutional research support for Dr. Sohlberg?s work. Dr. Sohlberg is a nationally recognized researcher in the field of cognitive rehabilitation having published numerous research articles evaluating the effectiveness of cognitive interventions and two leading textbooks in the field. She is supported by a number of federal grants for the development and evaluation of assistive technology for cognition. Dr. Sohlberg has been involved in the development of evidence-based practice guidelines for the treatment of traumatic brain injury for the Academy of Neurologic Communication Disorders & Sciences, the Veterans Administration and the Department of Defense. Dr. Sohlberg conducts clinical research and sees patients through the COE HEDCO clinic, a new state of the art multidisciplinary clinic that features eighteen therapy rooms that are outfitted with digital video cameras and microphones which are used to observe and record clinician-client interactions. Recently, Dr. Sohlberg opened up a veteran?s clinic in cooperation with the local veteran services agencies to provide cognitive rehabilitation services to local vets with mild to moderate brain injuries. Project Coordinator: Gina Griffiths MS CCC-SLP is a PhD candidate working under Drs. Sohlberg and Fickas. A speech pathologist since 1998, she has an extensive history within the field of cognitive rehabilitation including five years in home and community re-integration settings. In that position she frequently worked with adolescent and adult clients with acquired brain injury transitioning back to school or work situations that required high level reading skills. Prior to becoming a speech pathologist, she assisted with the development of software-based educational material. Her research interests are in the design and evaluation of treatment programs to address reading impairments following cognitive impairments, utilization and development of technology supports to enhance learning, and clinical teaching. Her interests include the development and evaluation of assistive technology to increase the social integration of people with chronic cognitive impairments, training clients with meta-cognitive strategies to manage executive function impairments and the development and evaluation of training methods used in graduate speech pathology programs. (UO Research Professor, Computer Science) has worked in developing product-line theory, methodology, and application for over eighteen years. He participated in the early development of product-line methods at the Software Productivity Consortium (Synthesis/FAST). Subsequently, he has explored issues in product-line methodology and its application is diverse areas including product-line requirements in avionics, productivity in massively parallel systems, and developing affordable, personalized assistive technology for the cognitively disabled. He is currently co-chair of an effort to develop software engineering standards for product-line engineering. (Portland VA Medical Center, Assistant Professor of Neurology, OHSU) has a special emphasis in treating veterans who have returned from Iraq and Afghanistan with mild traumatic brain injury or post-traumatic stress disorder. They present with deficits within the domains of executive control, selective attention, working memory, verbal learning, and processing speed that compromise, to varying degrees, their ability to succeed in the work place or in school. In particular, with regard to the current proposal, Dr. Sullivan has extensive experience in differentially diagnosing and treating, either directly, or indirectly, with the use of compensatory strategies, the impaired cognitive processes that contribute to high level reading impairment. Although Dr. Sullivan has focused primarily on his clinical work, he has an extensive background as a fully funded, independent investigator within the domains of selective attention and models of language processing. He has run his own laboratory and conducted all phases of research including experimental design, computerized set-up and programming of experiments, participant recruitment, data collection and analysis, and presentation of results. MS CCC-SLP (Chief of Speech Pathology Section at Tripler Army Medical Center (TAMC)) is on the adjunct graduate faculty of the Department of Communication Sciences and Disorders, John A. Burns School of Medicine, University of Hawaii. She is the Principal Investigator of two telehealth research protocols that were approved by the Department of the Army Clinical Investigation Regulatory Office and funded by the Pacific Telehealth and Technology Center, a Department of Defense-Department of Veterans Affairs joint venture. With regard to the current proposal, she serves as a member of TAMC?s interdisciplinary Traumatic Brain Injury (TBI) Team and provides direct services to Service Members and Veterans with mild TBI who demonstrate cognitive impairments that contribute to high level reading difficulties. She oversees TAMC Speech Pathology?s Computer/Electronic Accommodations Program (CAP) workstation that provides assistive technology to Service Members with disabilities to promote positive rehabilitation outcomes and future employment opportunities. Ms. Mashima received supplemental appropriations in 2008 and 2009 from the Proponency Office for Rehabilitation and Reintegration, Office of the Army Surgeon General for two proposals to improve care for TBI. The purpose of the funded initiative was to convene a Working Group in cooperation with leading DoD and VA medical treatment facilities to develop a ?best practice? protocol to meet the mission of providing appropriate levels of SLP services to wounded Service Members and Veterans with traumatic brain injury. Assistant Professor at UO in Special Education and Clinical Sciences. Dr. Harn has coordinated multiple federally funded research projects focused on designing, implementing, and evaluating reading interventions for students with learning disabilities. Current emphasis is on understanding the role of attention or executive functioning skills in students who do not respond to evidenced-based interventions. Research papers have examined the issue of timed versus un-timed assessments and how important it is to include both types of standardized assessments when evaluating reading development. While working as a school psychologist for 4 years in California, Dr. Harn administered a range of diagnostic assessments to students across the age span to appropriately assess the specific areas of concern (i.e., social emotional, intellectual, academic) to assist in program development and evaluation of student progress. Assistant Professor at UO in Special Education and Clinical Sciences. Her research publications encompass the measurement of reading processes, reading comprehension and meta-representational skill and development, heterogeneity of reading difficulties among adolescent struggling readers and the measurement and effects of literacy professional development for teachers and coaches. Jason Prideaux is a Research Assistant at the University of Oregon. He will lead the development effort for CampusReader. Jason has a M.S. degree in Computer and Information Science from the University of Oregon with a focus on Software Engineering. He has worked on and led several software development projects at the University of Oregon involving mobile and assistive technologies. His research interests are in the area of assistive and adaptive technology and ubiquitous computing. Jason and his wife Melissa enjoy going to Duck football games, hiking and fishing around Oregon, and traveling to new places. I am a Computer Science graduate student at the University of Oregon. I have interests in Software Engineering (issues in software design and distributed development) and Human Computer Interaction (Ubiquitous computing in Assistive Technology). Prior to working on the Campus Reader project, I was working on building a virtual platform (test bed) for testing location based applications(navigation assistants) with Professor Fickas. This work has been published at the Intelligent User Interfaces Workshop, Stanford University, CA, Feb. 2011. I am always excited about technology and how we can solve interesting real life problems to help the community. Anthony Wittig is a software developer for the University of Oregon. Since 2006 he has developed both commercial and educational websites. In his current role, Anthony supports grants aimed at improving the access and use of technology for people with cognitive impairments. These projects combine his interest in improving quality of life and developing useful software. Anthony says, "There is nothing more satisfying than being part of a team that really cares about what we can do to help." Anthony lives in Eugene Oregon with his wife Rachel and three children. When not working, he enjoys exploring the trails and rivers near Eugene with his family. Dr. Zebin Chen has worked on wearable computing applications and formal methods. He participated in the development of several research types for assistance living when he was a research assistant in the wearable computing lab in University of Oregon. He also has several publications using engineering approaches to ease model constructions (for example, aspect-oriented techniques). He worked on windows phone applications for rehabilitation. Reading comprehension deficits are pervasive for a disproportionate number of post-secondary students. An example of a growing population not able to meet the reading demands of college and community college courses are the large numbers of veterans returning form Iraq and Afghanistan seeking education and training benefits. It is estimated that 15-20% of veterans have suffered mild brain injury sufficient to affect academic ability. Another large and growing group of post-secondary students that is challenged by difficulties with reading comprehension are those with developmental conditions including adult attention deficit and hyperactivity disorder (ADHD) and attention deficit disorder (ADD). Estimates regarding the number of students enrolled in colleges who report clinically significant ADHD or ADD symptoms vary between 2% to 8%; approximately 25% of students receiving disability support services are receiving those for ADHD. These students have cognitive impairments that impact high level text processing skills and result in diverse reading profiles with difficulties in skills such as discerning between relevant and irrelevant information, drawing inferences, connecting background knowledge to new learning and retaining and applying what was learned at a later date. Typically such deficits are managed by teaching the use of study skills strategies. While there is strong face validity for these practices there is a lack of evidence-based practice, and virtually no information on candidacy or what types of deficits respond best to what types of strategies and supports. On the technology side, the popularity of electronic reading tablets offers a platform to deliver supports to improve reading comprehension and retention that could be adopted by college students. This project seeks to bridge the gap: develop the technology to support a diverse set of reading strategies in a highly adoptable form for college students with high-level reading impairments; do the science necessary to define a process that can assess each individual student, and prescribe a set of strategies that eventually will be delivered in a hardware-software package. A dynamic assessment process that matches reading profiles/impairments to strategy supports. A mapping of reading impairments to reading strategies. Translation of reading strategies to delivery on electronic reading tablets. A demonstration that personalization and adaptation are possible using our software engineering models. 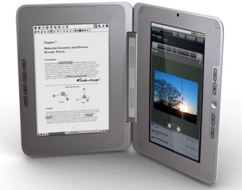 A dissemination package that uses open source software and hardware to deliver a research tool that could be used by companies designing commercialized reading tablets. To achieve these goals we will partner with three institutions that have large populations of struggling readers in post-secondary educational settings: two VA facilities that support and train veterans returning to educational settings; a student disability services program at a large urban state university. These groups have experience with the pervasive, high level reading challenges preventing educational success, and provide the natural contexts to evaluate our models and shape the tools generated from our research. We propose pilot studies, laboratory experiments and longitudinal studies to develop and evaluate the technology for a dynamic reading assessment and support tool. We expect two important outcomes: (1) the science missing from the literature that links reading impairments with reading strategies, and (2) a demonstration tool, built on the science, that supports an assessment process and a delivery mechanism. For the latter, in particular, we devote a large part of year 5 to making our tool highly attractive to companies who have the infrastructure to deliver products to the target populations, vets in particular and struggling college readers more generally. Develop a compendium of existing reading comprehension strategies matched to existing reading models and categorized by the type of cognitive domain(s) or solution(s) they address. Map strategies to the types of text modification or electronic supports that would be required to deliver the strategies in online form. Develop a dynamic reading assessment based on "Think Aloud" protocols that will provide fine-grained, empirical data on reading performance to ultimately to enable specific recommendations regarding high-level reading strategies. Write the application/product generator that will deliver a personalized reading application on a standard hardware platform (e.g., reading tablet). Year two will focus on a formal laboratory study to evaluate the efficacy of the CampusReader. Sixty veterans with mTBI attempting to return for post-secondary education will be recruited for the studies. We have selected this population because it is large, is in need of these supports, exhibits a wide range of high level reading impairments, and is available and accessible to our laboratory thanks to a partnership with the Portland Veterans Administration. This study will provide data to evaluate whether there are certain characteristics or groups of characteristics that benefit from specific strategies. The results from the experiment, particularly usability and preference ratings, will be used to further refine the CampusReader platform. Do prescribed supports for our target populations change based on reading content and situation? For example, will a dynamic assessment of an individual under narrative versus expository text reading conditions yield substantially different sets of strategies? Does the type/amount of supports needed change over time as a result of using the CampusReader i.e., can support be gradually reduced? That is, can the CampusReader serve as both a trainer and compensatory device? We will use subjects from our own clinical setting and from our research partner, the Portland VA. In the latter part of year three we will prepare for our longitudinal study to be conducted in year four. Working with both Tripler Army Medical Center and with an urban, state university and a community college, we will identify target courses and enter reading content into the CampusReader. We will partner with the Student Disabilities office at both an urban state university and a community college to integrate the CampusReader into coursework. We will also partner with the Wounded Service Members Team at Tripler Medical Center that has an outpatient program dedicated to supporting soldiers returning to school. We expect these two partners to supply a mix of course venues, with the university and community college providing a traditional classroom setting, and Tripler an online course setting (the majority of service members at Tripler use online courses for their continuing university work). Running a longitudinal study provides an opportunity to study the question of tool adaptation. We are particularly interested in whether the tool can respond to situational factors such as reader fatigue, pain, or lack of motivation (e.g., boredom/disinterest with the material). Consistent with the cognitive rehabilitation literature on self monitoring, we hypothesize that if we give the reader the ability to provide information on their physical and mental state, reading-strategies can be adapted in real-time to align with the reader's state. In essence, a dynamic, situational assessment can be applied, and an appropriate tool configuration can be enacted. By year 5 we will have an assessment process that maps individual impairments to reading strategies, and a software generator that accepts a reading strategy prescription and produces a tailored reading interface. This work will be backed by lab studies and a critical longitudinal study. This provides a demonstration platform, the CampusReader, that we anticipate will be attractive as a research tool for groups that have not yet placed a large investment in building their own platforms, e.g., in non-technical groups who view it as a solid research tool. We note that we have placed a major emphasis on veterans attempting to return to school after combat-related mTBI. 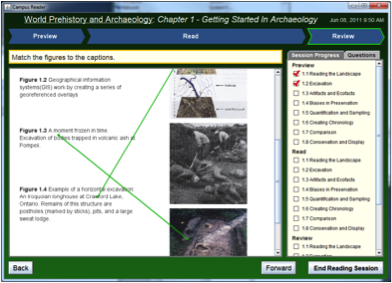 The way to effectively dispense technology like the CampusReader is through the Computer/Electronic Accommodations Program (CAP). Following the National Defense Authorization Act of October 2000, Congress granted CAP the authority to provide assistive technology, devices, and services free of charge to Federal agencies (e.g., TAMC) that have a partnership agreement with CAP. In essence, any CAP-approved device can be given out at no-charge to a vet through a clinical recommendation. We will work with the CAP program to smooth the way for uptake of the CampusReader. We are also targeting supports for students with learning disabilities. For distribution of our findings and supports through individual college offices, state-wide Tech Training Centers provide a means to disseminate new technology to instructors and staff. A good example is the California High Tech Center Training Unit that serves 114 colleges in California with eventual outreach to over 10,000 (ten thousand) students state-wide. We will work with the California High Tech Center to develop a package of material that can then be distributed to other state centers. Project team-members Gina Griffiths and Gina Biancarosa attended a November meeting hosted and sponsored by Carnegie Corporation of New York that included educational publishers, e-reading technology developers, reading researchers, and educator advocacy groups charged with discussing the role of electronic reading devices to the future of reading for electronic purposes. They wrote a report and submitted it to CCNY summarizing the panel recommendations. This paper will be made available off the project web site once cleared by CCNY. We have made substantial progress evaluating different means of assessing reading comprehension drawing from both basic and applied research literature. This has included evaluation of (1) a sentence verification task designed to differentiate between different levels of text processing (the recognition task from STIR – see section 4), (2) analysis of free recall transcripts using latent semantic analysis and other metrics to identify salient features that will support assessment and strategy development (e.g., how a "Think Aloud" procedure might be analyzed and used for assessment and strategy design), and (3) a Factors Study (see section 4) which draws upon a research-validated measure (Hannon & Daneman, 2005) shown to be sensitive at differentiating between different levels of text processing skills in the normal population. We have come to an agreement with Pearson Publishing to work with their (extensive) catalog of college textbooks for our initial demonstrations. Pearson has agreed to (a) give us access to raw content for a set of their digital texts, and (b) to give us feedback on versions of Campus Reader as they become available. The first book we have chosen as representative of a modern, intro textbook is Chazan’s World Prehistory and Archeology. We have been using the rich pedagogy and content of this book to test our first versions of the Campus Reader (as is shown in screenshots to follow). In essence, we have deconstructed pedagogy and content into adaptable components that can be viewed (or not) depending on the personal needs of the reader and the strategies selected. The figure below provides an example of the full richness (and complexity) of a textbook as it is delivered by Pearson. Note the multiple content components on the page, including long figure descriptions, vocabulary callouts, concept callouts and self-tests. In fact, the actual text takes second place to the many other components on the page. One of our first efforts was to view all of these varied components as assets in our Software Pharmacy model. 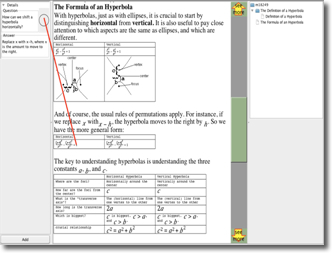 Allow the Campus Reader tool to decide which components to use for any specific reader and for any specific reading context. Perhaps the content will be presented exactly as the printed page above. Perhaps only the text will be presented. More likely, the various components will be staged over time to avoid the complex jumble of all-at-once presentation necessitated by traditional printed books. Stage 1. Review what background material is required to understand the section. Stage 2. Preview the concepts and content of the section. Stage 3. Read the section. Stage 4. Review what has been read. Each of the stages has a set of comprehension strategies that can be employed. These strategies are part of the asset base of our Software Pharmacy. Depending on the reader and the reading context, strategies can be brought into place to support the session. We have a prototype Campus Reader tool developed to begin to link the Software Pharmacy with strategy implementation. At the moment, only the final 3 stages are fully incorporated. 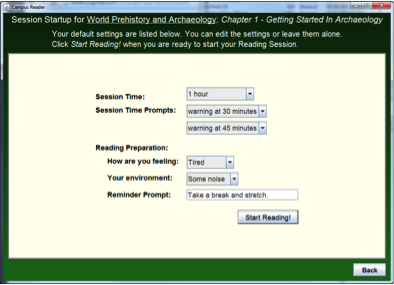 The next screen shows the preview-read-review stages on the top, with an indication of what stage the reader is in. Here we are in the Preview stage and are using a select-and-listen strategy: the reader is asked to click each heading from the section they are about to read and listen (text-to-speech) to the first sentence of each section heading. The green headings indicate ones the reader has listened to. By clicking the Forward button, the reader can at anytime move to the next stage, in this case, Read. 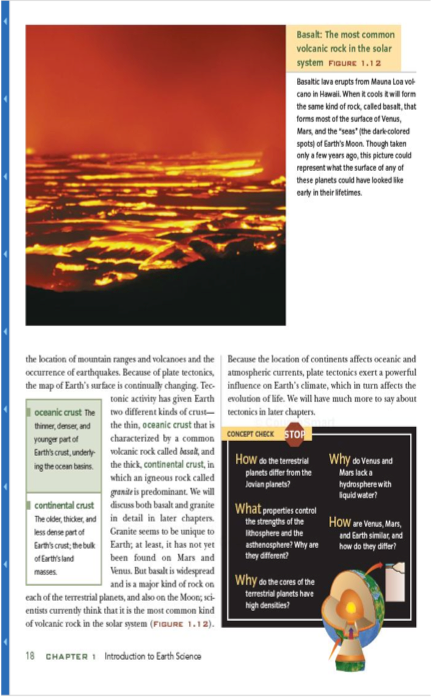 The next screenshot shows a Read strategy that asks the reader to consider comprehension questions that are part of the assets of this section. Notice that we have pulled the questions from the original book content and now decide when and if to present them. 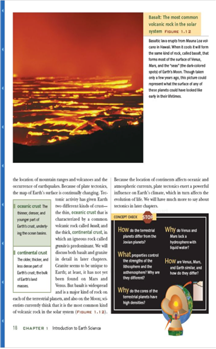 In this strategy, the reader is asked to highlight text that answers a question. When this is done, the question is checked off and the link remains to the highlight. When ready, the reader moves to the Review stage. The screenshot below shows a strategy that asks the reader to link figures with the captions/descriptions that go with them. The green lines record the reader’s answers. From this stage, a press of the Forward button moves the reader to the next assigned reading section. This will trigger a new cycle of the stages. We mentioned 4 stages and we have been working on the 4th, the Review stage that precedes Preview. In a test system, the reader marks concepts that are known to be used in the chapter but he or she is unfamiliar with. The Campus Reader tool stores those concepts on our web server. 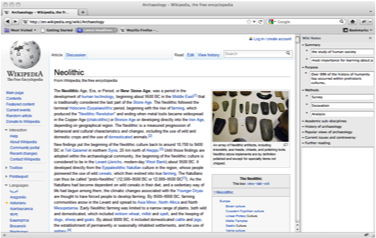 We have built a separate Wikipedia plug-in (in Firefox) that will aid the reader in using Wikipedia in doing background reading on the unfamiliar concepts. The plug-in activates when the reader surfs into Wikipedia. It reminds the reader of concepts that he or she has marked as confusing (in this case, in the Chazan assigned reading). 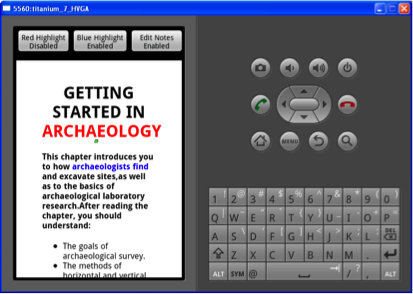 Assuming the reader chooses to find out more about Neolithic, the plug-in will go to that Wiki page and make a notes section available. As the reader enters these notes they are stored in the plug-in in case the reader surfs back to this page, and also made available to the Campus Reader tool. We expect, in the future, to integrate notes taken from Wikipedia into specific sections of a textbook, closing the loop. We believe this can be a powerful means to mix course-assigned textbook reading with more general background reading in a site like Wikipedia. The strategies we illustrate may or may not be ones in the final Campus Reader tool. They are our first approximations given the theory review we have done to date. The main point to make is that we have a workable framework for testing different strategies. We are interested in personalization. There are many factors to consider, including the reader’s general reading comprehension skills, their specific affect and physical state at this reading session, the attributes of the content to be read, the reading context (e.g., distrations), how long the reader can commit to the session, the goals of reading (e.g., general, exam review). Each of these may impinge on strategy selection. At the moment, we are attempting to gather the personalization data that may prove useful. For instance, to start a reading session, we gather both information about the reader, e.g., how long they have to read, their physical state, and information about the reading context. The caveat on this effort is that the actual connection between data of this type and actual strategy selection is yet to be shown. We will need to design new trials to make the case for such links. We have also been attempting to push the personalization up to the device level. It is clear that different students will have access to different reading platforms, including desktops, laptops, tablets and even phones. Mixed with these are the different OS, e.g., iOS, Android, Windows. The problem is attempting to build and maintain multiple versions of the Campus Reader tool across this mix. While we expect that web-apps using HTML5 may mitigate the multi-device and multi-platform problem in the future, our current explorations with HTML5 suggest the web-app technology is not quite ready for serious testing. We have instead turned to the Titanium tool (http://www.appcelerator.com), with its promise of write-once deploy-everywhere. To date, we have had success with early versions of the Campus Reader, written using Titanium, being ported to Windows and Android platforms, both tablet and phone. The figure above shows a test of whether we can support a reader in taking notes and highlighting using Titanium (non-trivial features given the indiosyncratic state of html rendering in mobile devices to date), in this case deploying on an Android phone. In the figure, the small green arrow marks a place where the reader has left a note; clicking the arrow will open the note. The reader has also highlighted some text in blue. Notes and highlighting are stored along with the text, allowing the reader to personalize the content. We plan to continue to test out more full-featured versions of Campus Reader in Titanium, verifying ports to major platforms and OS types. We began the STIR (Strategies To Improve Reading) study in winter of 2010. The aim of the STIR project was to provide initial validation of a prototype computerized assessment of reading, The project sought to lay the groundwork for a dynamic tool that could differentially assess the effects of reading strategies that enhance the encoding of connected text on reading comprehension. The concept for STIR has a strong theoretical foundation in the studies showing the effects on reading from difficulties with working memory and resource allocation processes (e.g, Carretti et al., 2005; Sinott & Coelho, 2007). It also draws from an extensive intervention literature with impaired readers who have difficulty with self regulation from etiologies other than ABI. This literature supports the benefit of using reading strategies (Rosenshine & Meister. 1994; Souvignier & Mokhelsgerami, 2006) to improve reading comprehension. The initial work focused on the development of tools and refinement of a software architecture to support the STIR study. Materials for two assessment conditions were developed. Condition One presented connected text without any strategy overlay. 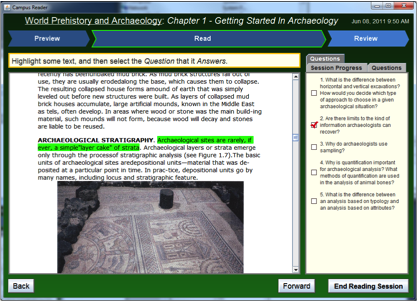 Condition Two had equivalent text with options for strategy overlays from the three main strategy categories identified in the reading strategy literature (Preview, Active Reading, and Review strategies). These were programmed onto the STIR tool. Following the development phase we conducted a pilot validation activity to evaluate discriminative and construct validity of the STIR by comparing differences between reading performance in STIR Condition One (reading text without strategy) and Conditions Two (reading text with strategy overlays for Preview, Active Reading and Review). Performance on the STIR assessments was analyzed to answer the following primary research questions: (1) Do individuals with ABI perform differently on Condition One (reading without strategy facilitation) than age, gender and education matched controls? (2) Do readers with ABI profit from the use of reading strategies in terms of quality and quantity of free recall and ability to answer reading comprehension questions. We are currently completing the data analyses and a formal report will follow. Sign up with our newsletter for information when the report is available. We began the design of a second study in the summer of 2010. We have produced a white-paper on the study at http://www.campusreader.org/dev/resources/pdfs/factors_study.pdf. Briefly, this study investigates the relationship between cognitive factors, mental health factors associated with post-traumatic stress disorder, and reading comprehension performance by comparing assessment findings of three groups: (1) veterans with a dual diagnosis of mild concussion and post-traumatic stress disorder, (2) veterans with only a diagnosis of post-traumatic stress disorder but no concussion diagnosis, and (3) age, gender and education matched non-veterans with no diagnosis of mild concussion and no diagnosis of PTSD. Results will be used to inform the personalization and strategy-selection component of the CampusReader tool. There are two main tracks in the technology component of the CampusReader project. The first is the actual hardware and software artifacts that we develop. As we release new versions of our tools, we welcome those interested to download and use them. We will handle this process through a Google Code site. 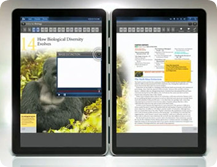 Our general approach will be to work initially with Windows Touchscreen devices, writing in pure Java. Eventually we plan to explore two other platforms, an Android reading tablet (for instance, the Edge) and the iPad reading tablet. We also have an interest in a web-based version of our tools that can be used on any platform. If you have an interest in our tools, new versions, new target platforms, please sign up on our (low volume) email list. The second track focuses on personalization. Our experience is that different reading strategies are appropriate for different people. Table 1 provides an example of how personalized strategies may address a variety of needs for a diverse population of struggling readers. Our interest is in the construction of a hardware/software platform (the CampusReader) that can be effectively configured to present, at minimum, the range of strategies seen in table 1. In essence, we will explore a means to personalize a reading device to provide strategies that fit a user's reading profile, as well as the changing context of reading for a college-level course. Over the past 10 years, we have developed a set of inter-linking models of software engineering that attempt to support the problem of personalizing assistive technology at scale. We briefly outline them below. Touch screen text tracking; prompt given when touch removed. Enrichment options such as links to resources to augment content. Narrative text for literature class versus expository text for science class. Waxing/waning pain and endurance issues. Ability to increase and decrease supports such as speed of presentation and number of comprehension prompts. The first model is one we call Personal and Contextual Requirements Engineering (PC-RE) [74,75] . The PC-RE model is used to address individual goals, preferences, and capabilities in system requirements, as well as changes in those requirements with time and context. The model aims to describe not only functions that meet people�s goals but also characteristics of the users, and how they would like computer systems to achieve their personal goals. Figure 1. The Software Pharmacy Process View. As shown on the left side of Figure 1, the PC-RE model consists of three layers for personal and contextual requirements with two dimensions of change at each layer � temporal and environmental. The model was defined from an earlier set of projects involving assistive technology. In this project, we will further refine the model for the domain of assigned reading for college courses. The first (top) level of the model focuses on the general stakeholder requirements as a group. For example, the requirements of any student working on assigned reading. The temporal dimension addresses evolution in changing stakeholder needs over time, for instance, the changing form of course content delivery, including fully online college courses. The environmental dimension addresses cultural, language, and gross geographical changes. Together, requirements at this level can characterize a family of products or software product line. The second level focuses on user characteristics that differentiate one user from another. User characteristics refine the broader specifications (expectation of user abilities and skills), obtained from the general stakeholder group. Here, the temporal dimension addresses how user goals, requirements, or capabilities can evolve over time. The environment dimension addresses the personal aspects of a user's environment. One physical context of interest is the setting of reading, changing over the day among typical student haunts, e.g., home/apt, classroom, library. Requirements specified at this level for an individual user dictate how the application should be personalized; equivalently, which member of the product family will meet an individual user�s needs. The bottom level focuses on individual goals: the user's preferences and desires irrespective of whether they are feasible at level two. For instance, a student's goal may be to carry a full semester load irrespective of whether this is feasible given the student's current state of reading impairment. It may be that certain goals at this level must be deferred, opening up new opportunities for goal monitoring  . The environment dimension addresses how a user would prefer to interact with a system in different contexts. The three levels combine to provide a reference and mindset towards personalization. The difficult task is building an assessment model that can gather the requirements called for. The software product-line model has been proposed as a means to address the scale issue in software families. A software product line is a set of software-intensive systems sharing a common, managed set of features that satisfy the specific needs of a particular market segment or mission and that are developed from a common set of core assets in a prescribed way. In practice, product-line development has been shown to reduce development effort seventy to ninety percent by systematically reusing common assets (e.g., software architecture, code, documentation, test cases, etc.) to produce members of a family of software systems. We have attempted to link the PC-RE model with a product-line model in the area of assistive technology. Our approach is to integrate a general product line model with a PC-RE assessment process that focuses on delivering individual products (not product families). We call this new personalized and domain-specific framework a software pharmacy, using the metaphor of prescription fulfillment. The framework is illustrated in the right side of Figure 1. The major activities (rectangles) and products (ovals) of the Software Pharmacy are illustrated. 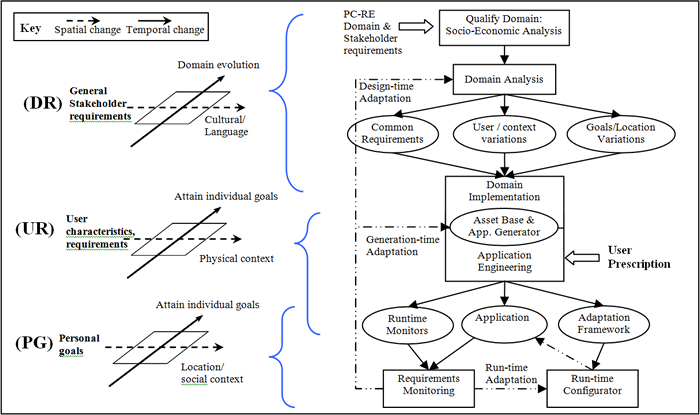 Since the different development phases are driven by requirements in different dimensions of the PC-RE, Figure 1 also illustrates the key relationships between the layers of the PC-RE model and activities in the process model. While the figure is somewhat complex in its details, the underlying conceptual structures are straightforward. The PC-RE model organizes personal requirements in three dimensions: stakeholder set (DR, UR, PG), temporal change, and spatial change. In concert, the Software Pharmacy development proceeds from broadly scoped activities (application domain, stakeholder-wide, and over the life-cycle) to tightly scoped activities (single user, personal device, in real-time). The PC-RE outputs drive activities in the Software Pharmacy as follows: the domain level requirements (DR) drive the Domain Analysis and Domain Implementation phases, the user level (UR) requirements drive the Application Engineering phase, and the personal user goals (PG) drive the real-time adaptation. In the following, we describe how the parts of the process work together to define a prescription for an assistive technology (AT) system, generate the system as a member of a product line, then monitor for discrepancies between the user�s goals and the system�s behavior in context. We use the term �user prescription� to refer to a formal specification of an individual user�s goals and requirements for a member of the AT system product-line implemented by a Software Pharmacy. To provide personalized systems, a software prescription must map from individual goals and capabilities to a set of components, and eventually to a generated product. Through prior work with the Software Pharmacy framework [61,62,63] , we have an extensive set of software components (the Asset Base of Figure 1). In particular, we have software components that can be employed to support reminders, self-regulation, attention, staying on task, and impulse control. We expect to be able to reuse these in developing reading products for the CampusReader. From our past experience, once a critical mass of components are available in the asset base, we can quickly turn out personalized products. The major remaining task is developing an assessment process that can generate user software prescriptions, linking the PC-RE model with the Software Pharmacy. This task is one we concentrate on for the first several years of the project. �Requirements monitoring� (see bottom box, Figure 1) refers to the insertion of code into a running system to gather information from which it can be determined whether, and to what degree, that running system is meeting its requirements  . Our own experiences show that we can avoid device abandonment over the long term only if the device works to stay consistent with user goals, requirements, and capabilities. Since all of these characteristics tend to change over time, we must monitor whether the system is meeting the users' needs, and in which ways to support system adaptation when needed. In addition, we have learned from our work with mobile assistive devices that a user�s goals, needs, and requirements can change depending on the context (e.g., temporal, environmental, social, technical, etc.) as the user moves through time and space. To continue meeting the user�s needs, the system must monitor the context and the discrepancy between user goals and the system behavior to adjust the system�s response in real time. We use the ReqMon toolkit  as our base monitoring system. 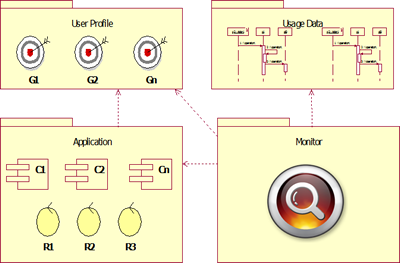 Figure 2 illustrates the basic components supported by ReqMon. An application (a product of the Software Pharmacy) consists of adaptable components whose processing is guided by the application (or mission) rules. A monitor watches the application and usage data with respect to the user�s profile (part of the user prescription). We build the monitoring code into the application. We have recently integrated ReqMon into the Software Pharmacy. The application generator (see Figure 1) is now able to include ReqMon monitors with other components that it composes. Still an open research question for us is the means of closing the adaptation loop, i.e., feeding monitored data back to the software pharmacy, reassessing, and potentially delivering a new product to meet changing needs. Up until this point, the adaptations from our projects have been over long spans of time, and have placed a human (a clinician or care provider) in the loop, analyzing monitored data and making changes as needed. For the personalization research we propose for the CampusReader, and the context-based personalization in particular, new challenges with monitoring the environment and automating the adaptation loop come to the fore. For instance, can we enlist the (human) reader as an active partner in providing context information? Will the reader find it acceptable to do some self-monitoring in terms of their physical and mental state, and pass this information along to our monitoring software? Meta-data may allow us to make some inferences about the type of content being read. Will the reader be willing to provide complementary information on the difficulty of the material for them, personally, in that moment (versus a normalized, static and context-free property like "9th grade level")? For adaptation, does it make sense to feed monitored data back into the assessment process (for reassessment)? How can we avoid abrupt changes to the reading interface as new products (with new strategies) are delivered to meet context needs? These are questions we will explore as part of this project. Again, we point the interested reader to our email sign-up for progress on these questions, and how that manifests itself in the tools delivered during the project.